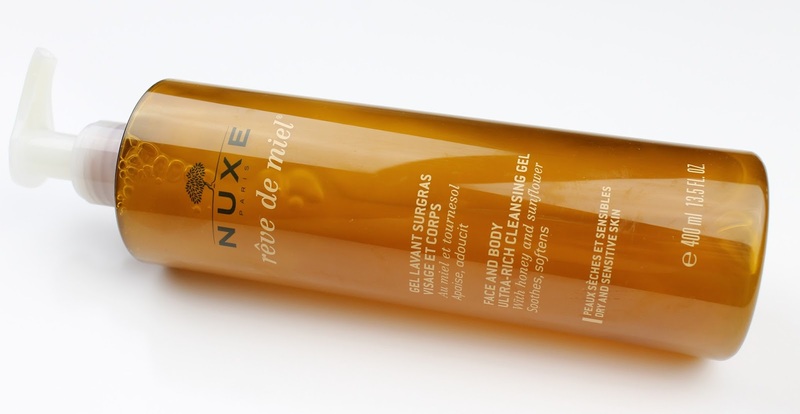 By this point, my deep love affair with Nuxe skincare should be fairly obvious. 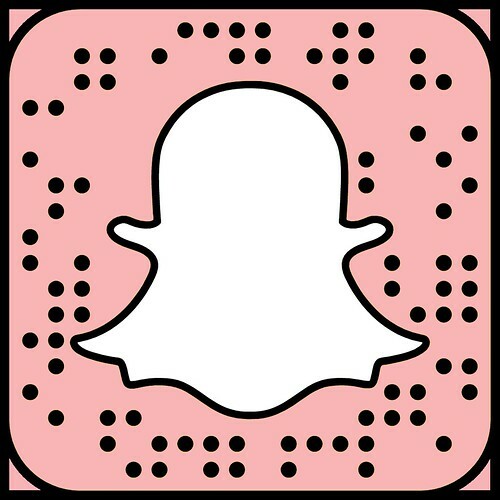 I am constantly raving about every product I try from the range because they are really that good. 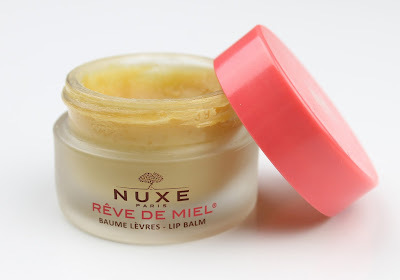 I just got some more products from the Rêve de Miel range and I am happy to report that they live up to my already exceptionally high expectations from Nuxe. Nuxe is a French pharmacy brand that is the perfect blend of natural ingredients and dermatologically proven results. It also feels really luxe while still being affordable and readily available at Priceline. I have noticed though that Priceline never carries the full range so if you are looking to see everything Nuxe has to offer, head over to the new Aussie website where you can order from directly. Rêve de Miel literally translates to "Honey Dream" which is a pretty apt description for this gorgeous line. The lip balm has sunflower oil, barley, argan, shea butter, acacia honey and vitamin E for a tons of moisturisation and grapefruit and lemon essential oils which blend for a beautiful subtle fragrance. This is definitely the most popular cult favourite from this line, or even the Nuxe range more broadly, and it is easy to see why. I have been applying this non stop every night before bed for the last 6 months and my lips have never been better. It is also worth noting that this is a huge 15g tub which will last you forever! This hand cream is made for and tested in much harsher dry environments than Australia (Canada and Europe) so you know it is going to get the job done. It has the same blend of honey, sunflower oil and shea butter along with coconut and sweet almond oil. It is also non greasy and feels very comfortable. I have seen such an improvement in the moisturisation levels of my hands and cuticles especially using this one. I will definitely keep using it all throughout the coming winter too! I love applying this every single night before bed and I wake up with silky smooth hands. Basically I go to bed smelling like a honey dream. I always have dry flaky skin so this one was a huge win for me. It is a soap free cleansing gel formula that leaves my skin feeling way more moisturised after a shower, rather than stripped and tight. In addition to smelling absolutely gorgeous like all the other products in the range, it packs in all the same moisturising oils and extracts. This is definitely going to be living in my shower for the foreseeable future, especially as the weather dries out. 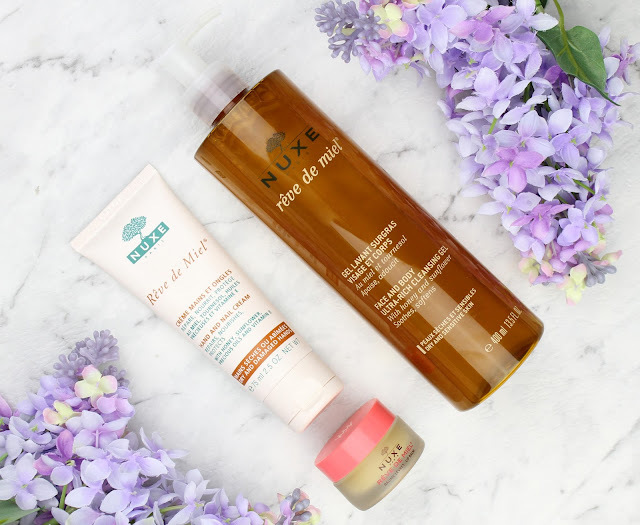 So there you have my overview of some of the products from the Rêve de Miel collection. Basically... I love them! It is hardly surprising though because Nuxe is hands down my favourite skincare brand. 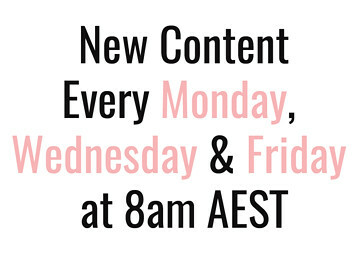 I obviously try a lot of different brands for my blog but I could happily forgo every other brand and just use this one for the rest of my life - as long as I could also have my Bioderma Sensibio Micellar too. 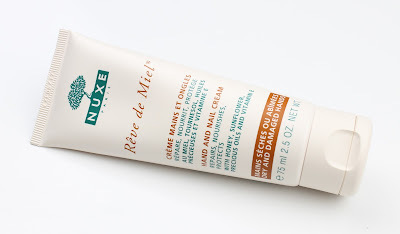 If you have never tried Nuxe, you need to! I'm always surprised I don't see more people raving about it because the whole range is incredible. Will you be trying these Nuxe products out after reading my review? Do you have your own favourites from the range? Definitely let me know because I probably won't rest until I have tried everything from the Nuxe range. I think the Rêve de Miel day & night creams as well as the Rose Petal cleansing range is next on my list! 1 comment on "Nuxe Rêve de Miel"
I have used their lip balms but yeah nothing else. You've got my interest piqued especially in the cleansing gel which sounds like a great idea since winters are just round the corner. And thanks for the website link since priceline hardly has anything from the range.